Come out every Thursday this summer for FREE movies and loads of fun! Nothing says summertime like watching your favorite movie under the stars and in the glow of the Atlanta skyline! The 2017 season of Movies in Central Park runs through August 3rd. This year, we’re amping up the nostalgia with films from 1990-2000! Every Thursday evening, May 18-August 3, 2017! 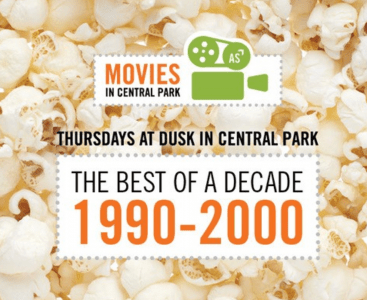 The film begins promptly at dusk, but you’ll want to get to Central Park a little early to get a good seat! Blankets and chairs are allowed. Watch for signs pointing to the designated seating sections for either! In the case of inclement weather, follow @AtlanticStation on all social media channels for an announcement regarding that night’s screening. For all other questions, please reach out to our friendly Concierge at (404) 410-4010. See you at the movies!